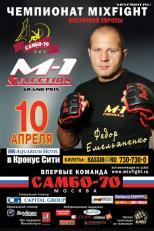 "Fedor Emelianenko will support fighters with his presence at the event. Maybe the spectators could see an exhibition fight with Fedor, but it only depends on the situation with his hand. We will know this only a week before the event." Fedor Emelianenko had to pull out of the fight again Vai Cavalo due to hand injury (and promotional disputes), but now it looks like M-1 Global will still use "The Last Emperor" to promote their own event. Fedor's participation in an exhibition bout may raise many questions over his motivation to fight at Strikeforce, what could lead to another rift between Scott Coker's promotion and M-1 Global.